Why not build on the momentum that Christmas in the Park brings to San Jose each year and extend the event all the way into October with Halloween in the Park! A lot of the infrastructure such as wiring, lighting, and booths could even be shared. 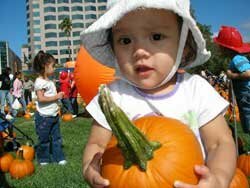 This would also make Downtown San Jose the epicenter of October Halloween experiences. Below you will find four years of brainstorming on this concept, so please have a look and provide your feedback and suggestions in the comments. Thanks! The largest draw to downtown San Jose for many years now has been Christmas in the Park. It has continued to grow year after year and brings in visitors from all over the Bay. It's economic impact is substantial and helps keep many downtown businesses afloat. Interesting idea. I'm thinking it could be cool to maybe use Pumpkins in the park as a kick off event. I would still be wary about creating a kind of never ending celebration downtown, because that might cheapen the experience or even make it seem like" oh god are they ever going to stop? Are they just trying to get more money out of us or what? "